SelectionMode, of type SelectionMode, the selection mode. SelectedItem, of type object, the selected item in the list. This property has a null value when no item is selected. SelectionChangedCommand, of type ICommand, which is executed when the selected item changes. SelectionChangedCommandParameter, of type object, which is the parameter that's passed to the SelectionChangedCommand. All of these properties are backed by BindableProperty objects, which means that the properties can be targets of data bindings. None – indicates that items cannot be selected. This is the default value. Single – indicates that a single item can be selected, with the selected item being highlighted. Multiple – indicates that multiple items can be selected, with the selected items being highlighted. PreviousSelection – the list of items that were selected, before the selection changed. CurrentSelection – the list of items that are selected, after the selection change. When the SelectionMode property is set to Single, a single item in the CollectionView can be selected. When an item is selected, the SelectedItem property will be set to the value of the selected item. When this property changes, the SelectionChangedCommand is executed (with the value of the SelectionChangedCommandParameter being passed to the ICommand), and the SelectionChanged event fires. The SelectionChanged event can be fired by changes that occur as a result of changing the SelectionMode property. The Style that contains the Selected VisualState must have a TargetType property value that's the type of the root element of the DataTemplate, which is set as the ItemTemplate property value. 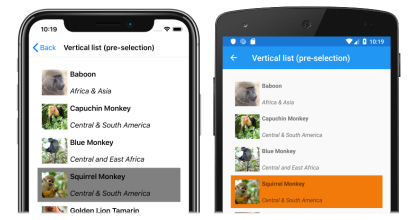 For more information about visual states, see Xamarin.Forms Visual State Manager. When the SelectionMode property is set to None, items in the CollectionView cannot be selected, the SelectedItem property will remain null, and the SelectionChanged event will not be fired. When an item has been selected and the SelectionMode property is changed from Single to None, the SelectedItem property will be set to null and the SelectionChanged event will be fired with an empty CurrentSelection property.